Hmm? How come that name sounded vaguely familiar to Mwah? Upon returning from Kona, Hawaii, and "Sleepless in Seattle" due to the three hours time change, once again I found Thyself perusing the past two weeks sections of the Car and Driver magazine's "Online" content I'd missed whilst on thou B-I-G' Island. As the story that caught my Attenzione regarded the name of Alfonso de Portago and a totally unknown to Mwah Rally driver chasing in his lost Bobsleigh tracks upon Switzerland's famed Olympiad circuit; Huh? Following in Portago's Tracks: Mark Higgins Takes On the Olympia Bobsled Run in a Car! Although driving a racecar on snow or ice isn't exactly new, as my mind wanders to "the Professor," aka Alain Prost winning an Ice Racing championship after his Formula 1 career, while that Niederlander Brat Max Dutchboy' Verstappen caused some uproar over racing a Red Bull Racing F1 chassis up a mountain recently. As Senor de Portago, who was actually the 12th Marquis de Portago of Spain, was a very interesting Chap, who led an extraordinarily daring lifestyle, once having flown an Aeroplane underneath London Bridge as a teenager simply in order to win a $500 bet! Alfonso also was proficient in Polo and Horse racing, having contested the Grand National Steeplechase at Aintree twice, albeit wasn't fond of a Jockey's diet! De Portago wasn't accustomed to doing things conventionally, and surprised the Bobsledding professionals after hastily throwing together a Bobsleigh team consisting of several cousins to represent Spain just weeks prior to the 1956 Winter Olympics at Cortina d'Ampezzo, Italy - where he finished fourth overall in the two man Bobsleigh, just a scant 0.16-seconds adrift of the Bronze medal! As de Portago would claim the bronze medal for the two man Bobsleigh at the 1957 FIBT World Championships held in Saint Moritz (the genesis for this story...) before focusing solely upon his remaining motor racing exploits. De Portago was bitten by the motor racing bug early in 1953, when attending the New York Auto Show, hastily agreeing to be Luigi Chinetti's co-driver for that year's Carrera Pan Americana race, as Chinetti was Scuderia Ferrari's North American importer, who'd ultimately create N.A.R.T. (North American Racing Team) that won the 1965 24 Heurs du Mans. De Portago was reputedly known as a "Two Car Man" due to his either crashing them or destroying them mechanically, most notably beginning his racing career without knowing how to shift a manual transmission! As Alfonso took part in several disciplines of motor racing, including participating in the 12 Hours of Sebring, along with winning several races, most notably the Tour de France with his good friend Edmund Nelson, an elevator attendant from New York as his navigator. Whilst he also won the Nassau Trophy race twice. Yet his most noticeable High profile drives occurred in Formula 1, in the sport's Heydays of the 1950's, when he drove for Il Commendatore', nee Enzo Ferrari as one of the countless Scuderia Ferrari Grands Prix ranks between 1956-57. De Portago's high-water mark came at the '56 British Grand Prix where he finished runner-up to Ferrari's team leader Juan Manuel Fangio, giving la Scuderia a 1-2 finish, albeit he shared the drive with Peter Collins, who took over from de Portago, as this was during the era when drivers could swap cars. De Portago contested five Grands Prix for Ferrari, beginning with the 1956 French Grand Prix, while his final outing came at the 1957 Argentine Grand Prix, where once again he scored points, albeit this time his fifth place finish was shared with José Froilán González, for which the Argentinean commandeered Alfonso's ride. 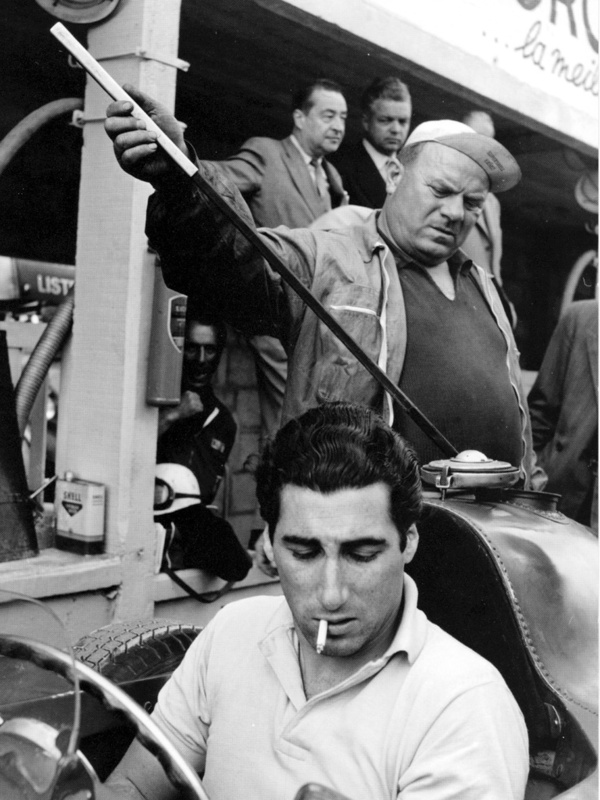 Alas, de Portago's blazing path towards stardom, having proclaimed once he'd become Formula 1 world champion abruptly came to an end sixty years ago on May 12th. Alfonso, and his good friend Edmund were contesting that year's storied Mille Miglia aboard one of Ferrari's four "Big Car" entries, and in his apparent haste, the Marquis was loathe to stop to change a rear tyre that mechanics had noted was rubbing against the bodywork. Although de Portago was willing to stop briefly for a public kiss from fashion model Linda Christian, which has been called "the Kiss of Death!" Sadly, nearing the end of the race while in third place, the Spaniard's tyre burst, sending the wayward Ferrari 335 S out of control, careening into a canal, striking a telephone pole and concrete mile marker before rolling violently and ultimately killing multiple spectators, five being children along with the racecar's two occupants! Three Scuderia Ferrari entries finished 1-2-3 that weekend, with Piero Taruffi in the No. 535 winning ahead of Wolfgang Von Trips #532, both piloting Ferrari 315 S models solo. While Olivier Gendebien co-drove the No. 417 in the GT Class, aboard a Ferrari 250 GT LWB (Lon Wheel Base) to a Scuderia Ferrari Podium sweep. Interestingly, car numbers corresponded to their respective start times of the event, with the fastest cars departing first. As Taruffi actually started three minutes behind Von Trips, at 5:35AM in the morning. Yet De Portago's savage accident would be the nail in the Mille Miglia's coffin, with Italy finally cancelling the deadly road race after the conclusion of the 24th running that year.